Memorial Day is this weekend and while many view it as an unofficial start to summer, it’s a day to honor the men and women in the armed forces for their ultimate sacrifice. In honor of Memorial Day, the Veterans Museum in Balboa Park has a series of events lined up for the weekend. Starting at 9 a.m. Friday, the Vietnam Veterans of San Diego will read the names of San Diegans who lost their lives during the Vietnam War, as well as, those missing in action. The day will end with a candlelight vigil at 7 p.m.
San Diego service members who lost their lives will be acknowledged again on Saturday. 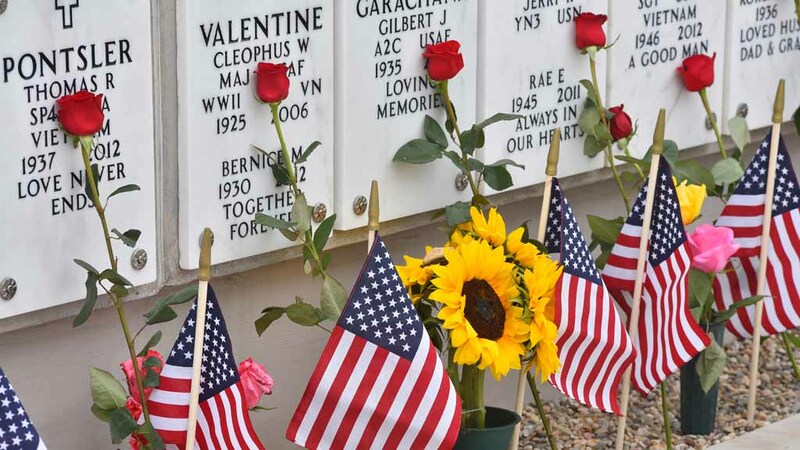 On Monday, the day will begin at 8 a.m. with a Memorial Day services followed by a Memorial Day healing drum circle at 5:30 p.m.
A ceremony will be held at Mt. Soledad, which includes a special plaque presentation honoring Ulysses S. Grant, American Civil War General and 18th President of the United States serving from 1869 to 1877. The keynote speaker is Brig. Gen. Jeffery Broadwater, the commanding general at National Train Center in Fort Irwin. The event takes place from 2 p.m. to 3 p.m. Monday. Miramar National Cemetery will host a service at 1 p.m. Sunday featuring Deputy Secretary of Veterans Affairs Thomas G. Bowman and speaker Capt. Joseph R. Buzzella Jr., Coast Guard Sector commander captain of the Port of San Diego. The service will include recognition of those who served. The USS Midway Museum will host a Veterans Wreath Remembrance Ceremony starting at 9:00 a.m. Friday. The ceremony will emphasize on the 65th anniversary of the end of the Korean War. Admission free for those who arrive by 9:30 a.m. Normal museum rates apply after that time. A ceremony will also take place at 10 a.m. Monday at Fort Rosecrans National Cemetery. Santee will host its 10th annual Street Fair and Craft Beer Festival on Saturday featuring 300 food and vendor booths, two stages of live entertainment, carnival rides, a beer garden and plenty of family-friendly activities. This year, there is a special memorial exhibit for Fallen Soldier of California from the War on Terror, which includes military and personal photos of each of California’s Fallen. The event runs from 10 a.m. to 6 p.m. and is free. The fair will take place at the Riverview Parkway and Town Center Parkway. Try food from around the world during the annual House of Pacific Relations’ Ethnic Food Fair in Balboa Park. The food fair takes place from 11 a.m. to 5 p.m. Sunday at the International Cottages. Attendees can expect to sample food from 34 different cultures. Live entertainment and native costumes will also be on display. Like horses? Love rodeo? Then the Valley Center Stampede Rodeo & Festival is a definite must-attend event. The family-friendly rodeo and community festival goes from Friday to Sunday. On Saturday, there is an historic parade before the rodeo. Tickets for the event range from $15 to $50. This is the only festival in San Diego County that celebrates all the things strawberry. Vista was once the “Strawberry Capital of the World,” according to organizers. The city still boasts many strawberry fields. More than 300 vendors will be at the festival, which includes athletic competition, pie eating, costumes and beauty contests. There is also carnival rides, music and food. The Vista Strawberry Festival goes from 8 p.m. to 6 p.m. Sunday and is free to attend.